The Age of Thrivability: Vital Perspectives and Practices for a Better World by Michelle Holliday is a new book which will be released this fall. Michelle Holliday is a facilitator, consultant, researcher, presenter, and writer. Her work centers around “thrivability,” which is based on a view of organizations and communities as living systems. It’s this view which Michelle Holliday eloquently elaborates in her book. Thrivability can be understood as “the intention and practice of enabling life to thrive as fully as possible” (p. 21). It’s about “crafting an organization as a “space for life”” (p. 107). But thrivability is not only about “vibrant health and joy” all the time (p. 149). It also includes “death” and “conflict” (p.149). Michelle Holliday writes that “the persistence of mechanistic thinking … is valuable to some degree” but is “absurd if taken as the total view” (p. 41). I fully agree. Systems thinking has “remained (and still generally remains) grounded in a mechanistic model” (p. 40). The result is that “many of the changes made to date on the basis of systems thinking represent important first steps in a new direction, while most have been superficial and built on familiar values” (p. 41). Even W. Edwards Deming’s “forward-looking systems vision was implemented in a mechanistic fashion” (p. 40). Although Deming insisted that “measurement and quotas be replaced with leadership and removal of fear from the workplace, the widespread application has focused squarely on statistic measurement” (p. 41). A key differentiating factor between mechanical systems and living systems is that “living systems integrates divergent parts into a convergent whole characterized by dynamic relationship internally and externally in a continuous process of self-organization and self-creation” (p. 42). Keywords here are self-integration, self-organization and self-creation. This means that “the real point of our efforts is to participate in and support life’s ongoing ability to thrive” (p. 95). When we see “organizations as living ecosystems, the goal … naturally shifts to enabling life to thrive – contributing to and participating in life’s process[es] and pattern[s]” (p. 101). What are these patterns? 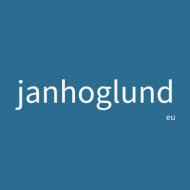 Patterns of Relationship (Connective Infrastructure): “The divergent parts are connected and supported in a pattern of responsive relationship with each other and with context” (p. 30). 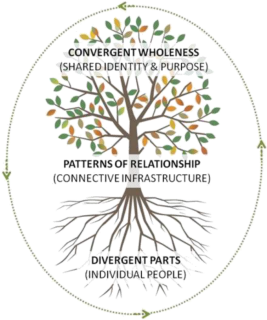 Convergent Wholeness (Shared Identity & Purpose): “The divergent parts come together in relationship to form a convergent whole with new characteristics and capabilities” (p. 30). Generally, 1) the more “diverse and self-expressive the parts are able to be,” 2) the more “open and free-flowing the interactions” are, and 3) the more “consistency and convergence there is at the level of the whole”, the more “resilient, adaptive and creative the living system is likely to be” (pp. 30–31). This means that our “most appropriate and important role is not to tightly control the activities of our human systems, but to cultivate the necessary fertile conditions for life to self-organize and self-integrate” (p. 31). Michelle Holliday has “spent the past decade bringing these patterns of living systems into” her “consulting work with a range of organizations” (p. 18). Perhaps most importantly, recognizing “organizations as living systems has encouraged … leaders to see themselves less as engineers and managers and more as stewards in service of life” (p. 18). Stewardship is to “create the conditions for the organization-as-a-living ecosystem to self-integrate — to self-organize and to enable collective intelligence, responsiveness and resilience to emerge” (p. 47). Stewardship replaces “control and guidance” with “encouragement and invitation” (p. 122). An “invitation-based, broadly participatory process” enriches the organization “through learning and relationship” (p. 156). Michelle Holliday’s book is very inspiring! I love her tree metaphor. What gives Michelle’s book an edge is that she is serious about the living systems view. She even acknowledges that death is a vital aspect of thrivability. It’s certainly not superficial mechanical thinking. What’s nice is also that it’s possible to approach the book as an open buffet. I enjoyed the real-life stories in the book. Stewardship is less a role and more a commitment offered from a stance of reverence for life. What is called for is not a set of best practices, but a recognition of the life in our organizations and the world around us. The book shows what’s possible if we go beyond our old habits of thought and action. Thrivability requires that we see life’s intrinsic value and act accordingly.